What the US-led coalition did to Syria’s Raqqa is comparable to the infamous Allied bombing of Dresden in 1945, the Russian Defense Ministry said, adding that the allies may be rushing to pour money into Raqqa to cover up the aftermath. Raqqa, which has served as the Syrian stronghold of the terrorist group Islamic State (IS, formerly ISIS/ISIL) since January 2014, was seized by the US-backed group Syrian Democratic Forces earlier this week. Some 80 percent of residential buildings in the city are estimated to have been rendered uninhabitable during the fighting, which involved massive bombardment by the US-led coalition’s airstrikes and artillery shelling. “Raqqa is still smoldering after the bombardment by the international coalition, and senior officials in Washington, Paris and Berlina are already pouring out pledges to allocate tens of millions of dollars and euros for reconstruction,” Russian Defense Ministry Spokesman Gen. Igor Konashenkov said Sunday. He said the intention to help Raqqa residents was commendable, but Moscow could not but wonder why previously all its calls to deliver humanitarian aid to other parts of Syria had been ignored or rejected. “We made a list of cities and villages most in need and we didn’t distinguish between ‘bad’ and ‘good’ Syrians. But the answer from Washington, Berlin, Paris and London has always been the same: we can’t, we won’t,” the general said. 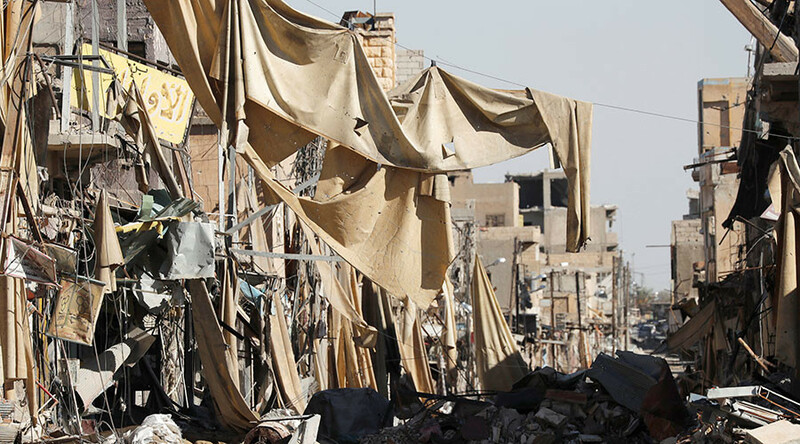 The change of heart may indicate that the US-led coalition simply wants to get rid of the evidence of its “barbaric bombing” of Raqqa, which resulted in “thousands of civilians, which [the coalition] claimed to be liberating form ISIL, being buried under debris”. 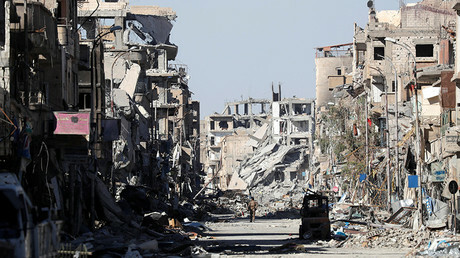 “Raqqa’s fate calls to mind that of Dresden in 1945, leveled by the US-British bombings,” Konashenkov added, referring to the controversial campaign reaching a peak in February 1945, during which American and British bombers dropped over 3,900 tons of bombs on the Nazi-controlled German city, killing some 25,000 civilians and destroying much of its center. The military necessity for such an action was questioned by many people, while some, including British Prime Minister Winston Churchill, perceived its goal as terrorizing the German population. The SDF began its siege of Raqqa in June, with the US-led coalition supporting it with airstrikes, artillery fire, intelligence and training. The hostilities caused an exodus of civilians from the city, with some 270,000 displaced persons currently living in refugee camps in the province. Some 1,800 to 1,900 civilians have been killed in the fighting, at least 1,300 of whom were killed by the coalition, according to an estimate by the Airwars monitoring group.